Public space is not necessarily a playful place, but still can be considered as a potential site for the encounter and exchange of the members of its respective community or society. To re-instate playfulness as a way of life means to intervene with conditioned social behaviours practiced in public. Having achieved such a change in public space might also lead to the playful transformation of everyday activities and moods of the private sphere as well. 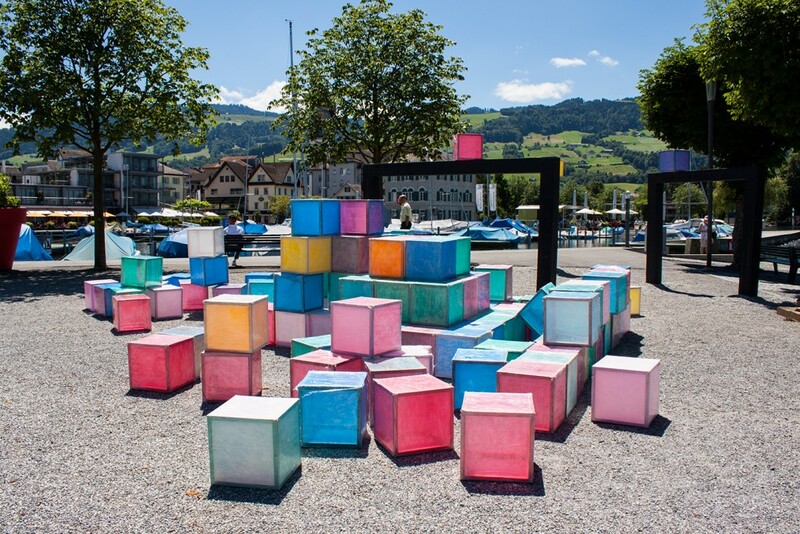 This project Playground is an installative, interactive intervention, which entails making an immense number of formalistic, colourful cubes and several frames available in a public space at the harbour in Lachen. As an object installation, in itself the artwork embellishes and enhances its surroundings, both ornamentally and conceptually through the combination of form with a diversity of colours. As an interactive intervention, the approach is to openly invite passers-by and users of the surroundings to freely play by transforming the set-up of the playground elements and/or using the arrangement as a flexible background for all kind of playful activities. The underlying approach of the artwork is to address the challenge of working in public space not only by intervening through designed and spatial features, but especially to disrupt established, powerful structures governing societal behaviour. In particular, I propose that such conditioned behaviour limits initiatives to interact with seemingly fixed elements in public space as well as it confines the motivation to interact with others, a situation I aim to change.